The AppExchange is a magical place, just by having a quick browse once in awhile, you can potentially save your company $1000’s worth of time or resources with a free App. Of course the AppExchange has a lot more than just free Apps, it has complete end to end solutions that you can run entire departments within your business on. Within the AppExchange, there is a “popular” section, this gives a ranking to Apps which is based on installs, clicks and other factors (Review/Ratings aren’t counted), Within this post you will find the top 10 Apps as rated by the Salesforce AppExchange, with a brief description of each. First up we have a Salesforce Labs App. If you don’t know what these are, they are simply free Apps that Salesforce create to make our lives easier. The Mass Update & Edit App gives you and your users the ability to mass update list views, or even related lists with a couple of clicks. You can simply select as many records as you wish, follow the simple wizard and update multiple fields for multiple records. Easy! LinkPoint360 has proved itself as one of the leaders within the Outlook to Salesforce integration space. It gives your users an easy to use side panel within Microsoft Outlook which allows you to view Salesforce data, create new records without leaving Outlook and the ability to sync contracts, calendars and tasks. Docusign has become a tool that most businesses could not function without. Docusign gives you the ability for you and your clients to sign contracts, purchase orders and any other legal document, digitally. As Docusign is not only based on Salesforce, this App gives you an easy way to send out these documents through your records on Salesforce. Definitely been proved as a complete game changer. 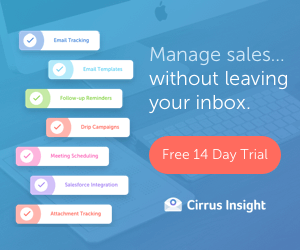 Cirrus Insight gives you the ability to interact with Salesforce in your inbox. With the ability to work with many of the top email providers, you can sync emails, calendar and view Salesforce data all within your inbox. This is usually a perfect match for an inside sales department where a huge chunk of the day will be spent inside of the inbox. It’s also a perfect match for Administrators and managers that want to ensure everything their users are doing are getting logged in Salesforce. Mailchimp is by far the most popular email marketing platform, so it’s pretty fitting that their corresponding AppExchange App has a spot in the most popular. This free simple App gives you the ability to create email campaigns, manage your lists and subscribers all from within Salesforce. One of the best features of this App is to add a Visualforce component to your Lead & Contact records, giving you the ability to see their interaction with your marketing emails. dataloder.io has come to my rescue many a time, and is probably one of the Apps I use the most on this list. It gives you the ability to create, update, upsert and delete records in Salesforce with an extremely easy to use interface. Before dataloader.io one of the only Dataloaders available was the Salesforce Data Loader. Although it does the job, most of us can agree it’s pretty archaic. dataloader.io is completely free but does have some premium features a lot of admins will find useful. An App that is very close to my heart as I spent 2 very fun years working for them, Conga! There is probably no need for an introduction really but here it goes anyway. 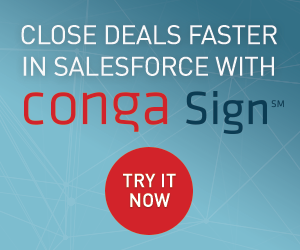 Conga is a document generation App that allows you to create documents, powerpoint presentations, spreadsheets, PDF’s & emails using your Salesforce data.. Some of the most common use cases for this can be Invoices, Contracts, Quotes & Presentation Decks. Quickly climbing the AppExchange ranking as one of the fresher email Apps, Ebsta is specifically designed for Gmail & Salesforce. With a whole host of unique feature, it’s clear to see how Ebsta has climbed so high. One feature in particular I’ve used first hand is “Team Sync”, this allows you to view emails that you AND your team have sent to an account or contact with a shared view within Salesforce. Data.com is a paid add-on for Salesforce that allows you to clean your Lead, Account & Contact data with professionally sourced data. 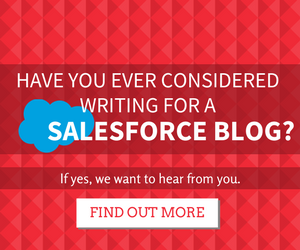 This free Salesforce Labs App gives you a taste of how your Organisation could benefit from Data.com. It scans through all your records and gives you a summary of their “Health” by comparing it to the data Salesforce have on file. Depending on how confident you are about your data, this could be an enlightening experience. At #1 we have none other than Salesforce steaming about with another Labs product! The Salesforce Adoption Dashboards pack gives you a combination of reports and a Dashboard which can provide key metrics about your user adoption. This is an App that Salesforce do recommend to all new users, and for good reason. It allows you to see trends and what is and isn’t working inside your Organisation. This is of course very important for the sponsors inside the Organisation, and of course for Salesforce as well. There’s no reason not to install this pack. I was disappointed to see that Field Trip was just pipped to the post by the other fantastic Apps we have on show, so I decided to add in a bonus. Field Trip allows you to report on the usage of your fields, which allows you to see used fields, unused fields and perhaps fields that are being used in an incorrect way. It uses the standard Reports tab in Salesforce which ensures every Administrator is going to know how to use this App. Take a Field Trip today! I second Chirag’s comment. Metadata Search is a great tool when you step into a new org. Thanks for this! I have a client who just asked how she can mass update one field for several of her Contacts. I will have to tell her about Mass Update & Edit! We also use Qandor Draggin’ Role, a drag and drop Role Hierarchy utility… manage Roles and Users with ease! and Etherios EasyDescribe – Free MetaData Viewer/Extractor to view and extract object metadata. You should check these apps too. What, no Demand Tools!! that’s my #1 salesforce add-on. Astapor Marketing Attribution (https://astapor.dk/marketing-attribution) let’s you trace your revenue back to marketing campaigns and sales activities in Salesforce. Plus it uses your historical data and machine learning to predict the impact of future campaigns. Astapor VAT Checker (https://astapor.dk/vat-checker) enables you to validate your business partners’ information against the EU VIES service using only their VAT number. Hope you’ll find them useful! some of those products are very old. and not friendly at all. Add texting to your Salesforce contact center and let your sales team close more sales. Contact us today to learn more! Would you be able to provide 1 more list of 10 most popular apps used in Energy and Resource Industry ? We just working on new app, that allows users to populate text fields, on accounts, contacts, leads and opportunities via reports. Its very much point and click admin reducing the need for triggers. I would love you to check it out and let me know your feedback. https://appexchange.salesforce.com/appxListingDetail?listingId=a0N3A00000EcrLFUAZ disclaimer is this our app we are about to release.